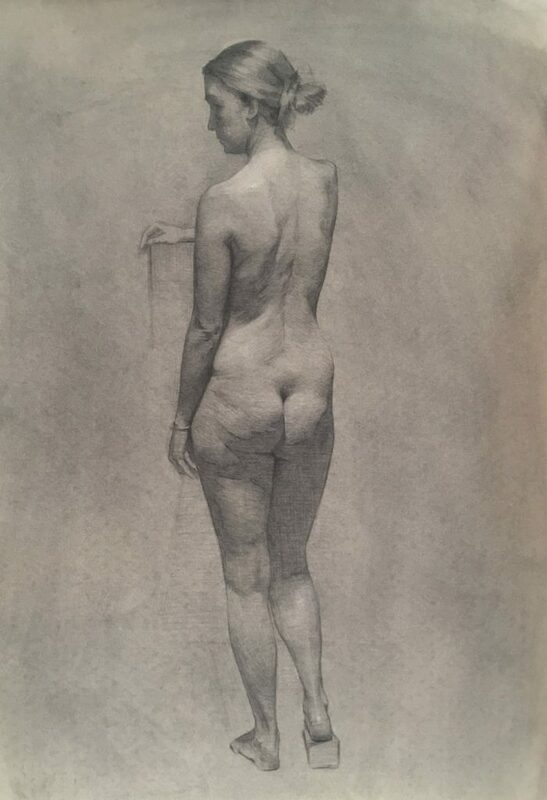 Study long-pose figure drawing in pencil or charcoal and experience the practice and methods of a professional atelier art studio in this five to ten week course. Work towards your LARA Foundation or Diploma Certificate. 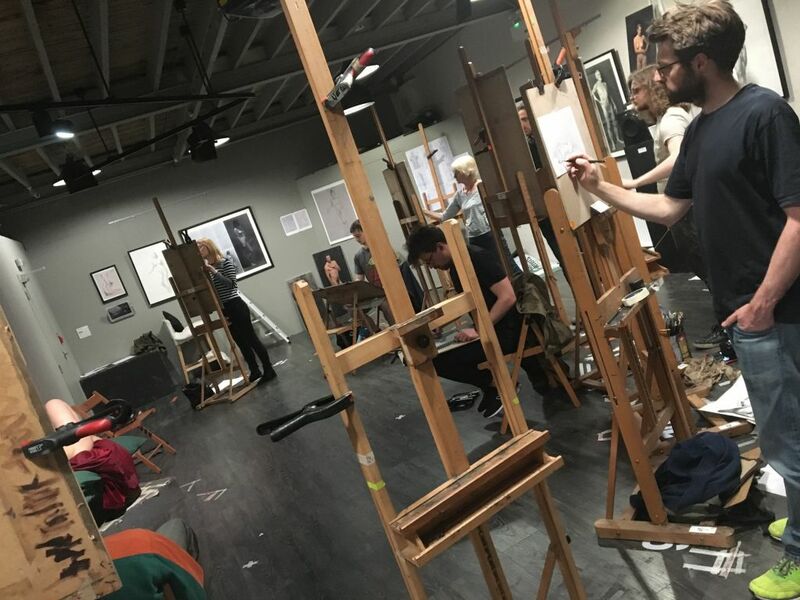 As LARA celebrates ten years of providing quality art training, our tutors have reconfigured the curriculum to incorporate everything we’ve learnt about teaching you along the way! 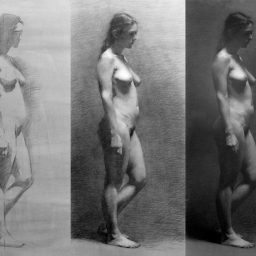 Our Foundation (150 days) and Diploma (300 days) students are now all following this carefully crafted set of exercises, designed to take the student from beginner to proficient painter in oils. And now we’d like to open this opportunity to our Saturday School students. If this is something you are interested in please let the school know when you apply so that the necessary arrangements can be made (you will do some exercises other than figure drawing). 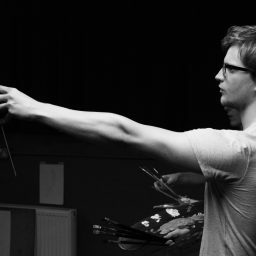 We are pleased to also announce that exercises from the curriculum can also be completed in our mid-week tutored Evening Masterclasses. Of course, progress through the curriculum will be slow at three-six hours a week but we understand sometimes life prevents us dedicating more time to our passion – we think it’s still best to use the time you have. Please note, there is no obligation to follow the Foundation or Diploma curriculum on Saturday School and the usual tailored programme of figure drawing exercises can still be undertaken. 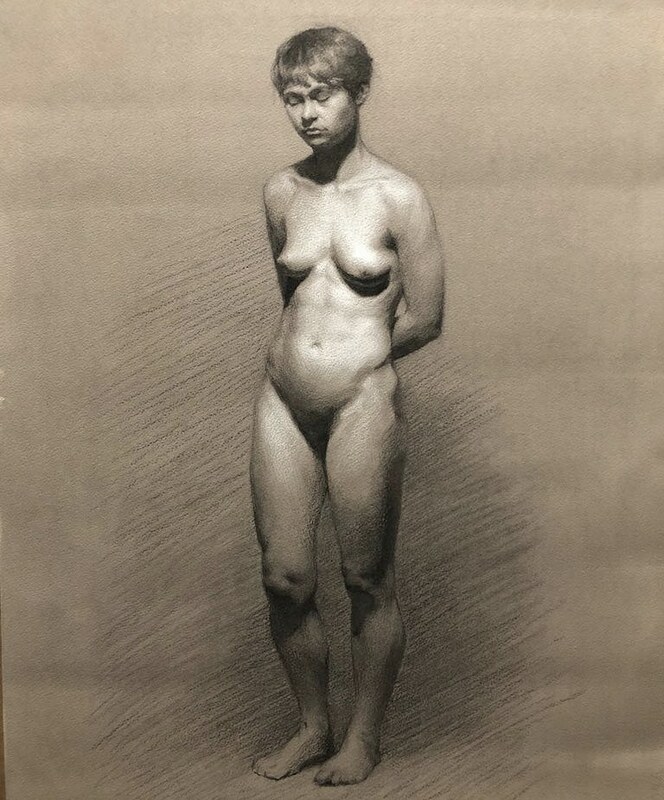 We teach a clear and simple approach to developing an accurate, naturalistic figure drawing using the sight-size technique and you can expect the same high quality of teaching found on our full-time courses. 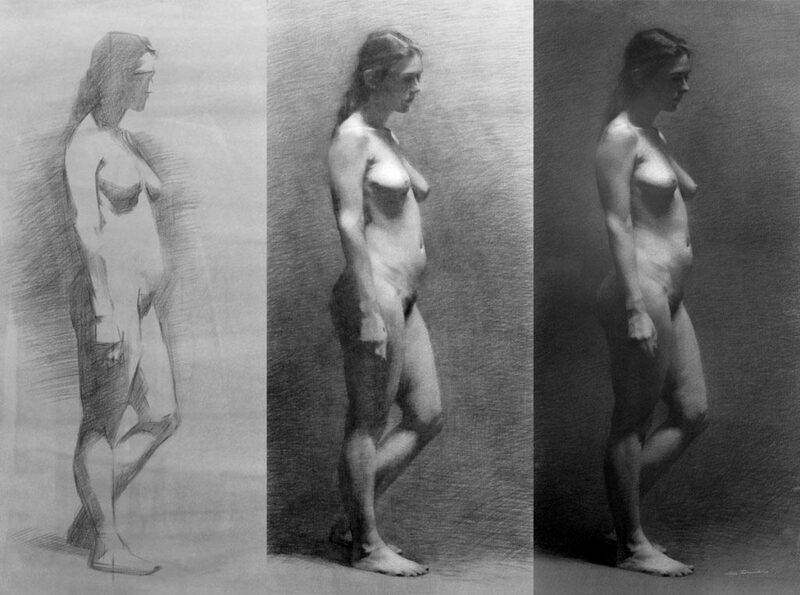 Working from the model in a sustained pose over five to ten weeks you learn the fundamentals of the sight-size technique in the context of line and mass drawing. The teaching structure is the same as the Foundation and Diploma course. 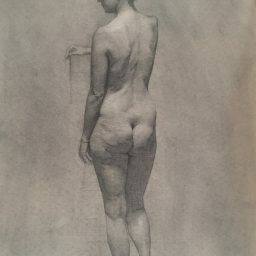 Given the unique advantage of retaining the same spot every week, you are enabled in experiencing the value of studying a prolonged pose. You are given continual critiques and feedback about improvements to take into the next pose or further work outside the school. 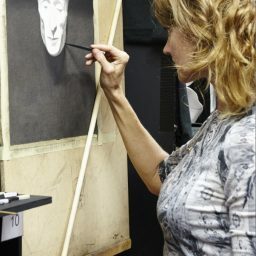 The figure room is located within the main studio, allowing for the use of the main facilities of the full-time school. 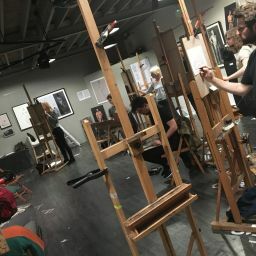 The Saturday School takes place in the same figure room as the Foundation and Diploma course and therefore benefits from the excellent studio facilities. We have a range of high quality CRI light options, all the way from soft and hard artificial lights of differing temperature. 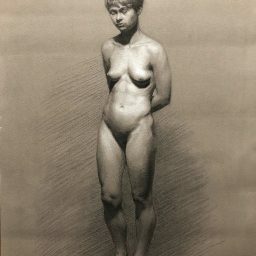 Resulting in the truest skin tone and recreating the similar lighting conditions used in atelier studios though out the years. 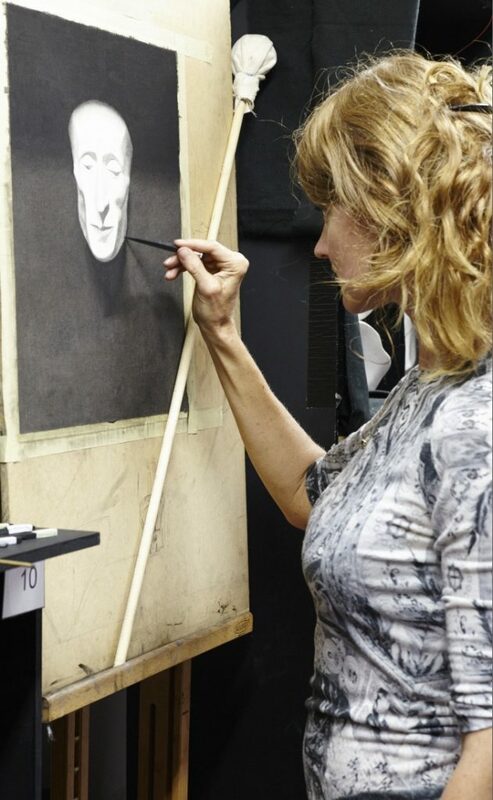 Limited to 15 students, this is a wonderful opportunity for close instruction under a professional tutor. You can choose to study five or ten weeks consecutively or alternatively opt for our flexible study of eight weeks over the ten weeks. You can sign up for the morning, afternoon, or the whole day and occasionally, it is possible to join Saturday School part way through. Please note there is a break of one Saturday half way through, after the first five consecutive Saturdays, when there will be no Saturday School and classes resume as normal the week after. Half-day studies may be subject to availability and change with priority going to those who want to study for full days. Nitram charcoal* (vine) H, HB, B This is only required if you have progressed onto charcoal. It can be purchased from the school. 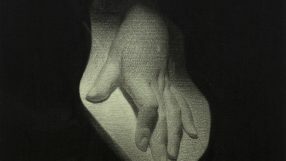 If you are working in charcoal you will need to use Roma paper which can be purchased from the school. 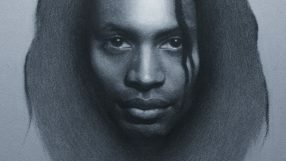 "Art making is fundamentally a creative endeavour. We must not forget this as we embark on our academic training. Every method learnt must be valued not only on how accurate an effect can be obtained but also on how much freedom it allows"